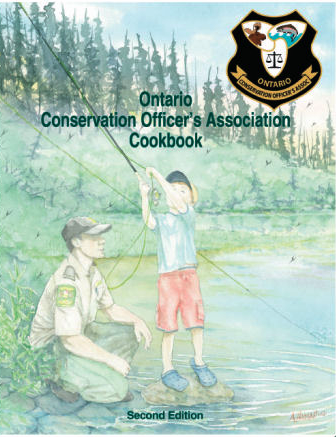 There are plenty of wild fish and game recipe books outthere, to be sure, but this new offering from the Ontario Conservation Officer?s Association aims to also give something back. How so? Proceeds fromsales of the $20 cookbook will go toward the non-profit association?s variousgood works, from outdoors programs for kids to college bursaries to youthtrapping awards. Think of it as cooking for the outdoorsmen and women oftomorrow. The new Ontario Conservation Officer?s Association Cookbookis actually the second edition of the original cookbook first published in thegroup?s centennial year of 1992. As with that first edition, the new cookbookfeatures favourite recipes from association members and their families. In all,the full-colour, 184-page edition features 352 recipes, complete with thestories behind the various dishes. The OntarioConservation Officer?s Association includes active and retired COs andother natural resources law enforcement officers in Ontario; the cookbookrepresents the group?s major fundraising initiative. Please contact Tim Rochette at vicepresident17@ocoa.ca to placeorders.